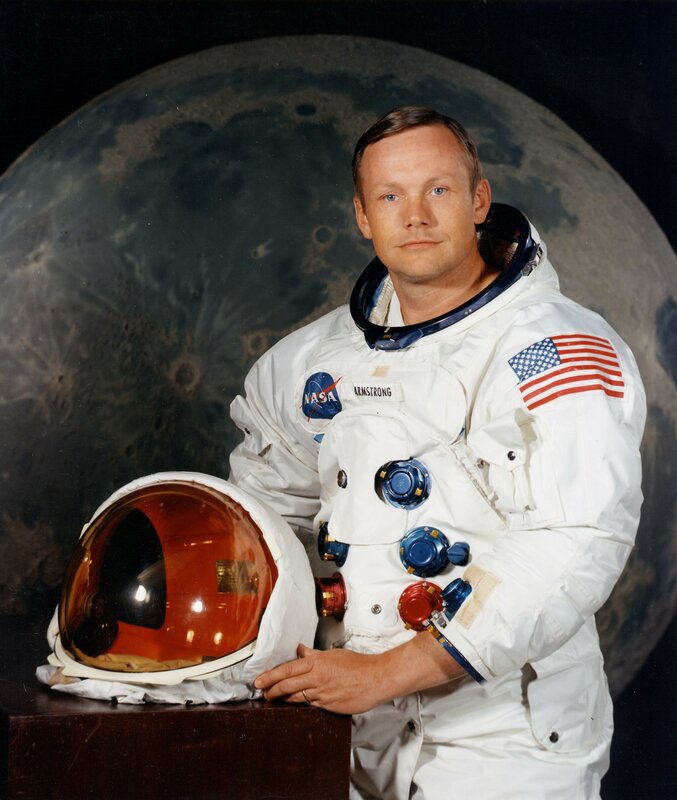 I was very sorry to hear that Neil Armstrong died on Saturday. I’ve had a number of where-were-you-when moments in my life so far, and most of the ones I remember most vividly are the tragedies, not the triumphs. But the walk on the moon in 1969 was almost impossible to believe, even though I saw it with my own eyes, and was so inspirational! I really felt there was nothing the American people could not do. My sister Juanita and her family were staying with Mother, Daddy and me on the farm that July. We had all been eagerly following the news as the Apollo 11 spacecraft reached the moon and went into orbit. Juanita’s husband, Larry, was an Army officer, a helicopter pilot, and he was nearly beside himself with excitement. The moonwalk was going to be later that night, and we made plans to stay up and watch it. This was history being made. And we could watch it on TV! It was going to be a late night for me, as an early-to-bed teenager, so I was excited by that alone, much less for the first man to walk on the moon. Juanita put her small sons to bed, and the five of us sat in the living room under the drone of the air conditioner, spread out on the couch, chairs and the floor (for me.) We watched the blurry black-and-white video stream as the Eagle landed, and waited what seemed like hours for the walk on the moon. Finally, at nearly 10 p.m. Central time, NASA Mission Control and the TV reporters announced that Neil Armstrong was going to leave the lunar lander. “They can say they saw it, even if they don’t remember,” Larry said. The boys soon drifted off to sleep again on the couch. Larry rode one of the couch cushions and punched it in his excitement. Mother and Daddy seemed stunned. That the world could hold this! So today I am remembering Neil Armstrong and his “one small step for a man.” He did not behave like a hotshot flyboy; he was modest, low-key, and a test pilot who changed history. May Neil Armstrong rest in peace, and may we return astronauts to space someday. Summer doesn’t officially end until the autumnal equinox on September 22, but for most of us Labor Day weekend spells the end of summer. My teacher friends are already going back to work! So this is a short recap of inexpensive summer pleasures. I hope you’ve already enjoyed most of them. If not, you have two weeks! Pedicures. There’s something about bright toenails that always cheers me up. Getting your nails done is cheap in my area. But I spent many a day in my youth with Revlon or Sally Hanson products, striving for the perfect red. Boys, please don’t do polish unless it’s black! Homegrown tomatoes. The season is peaking here, but it won’t last much longer anywhere. 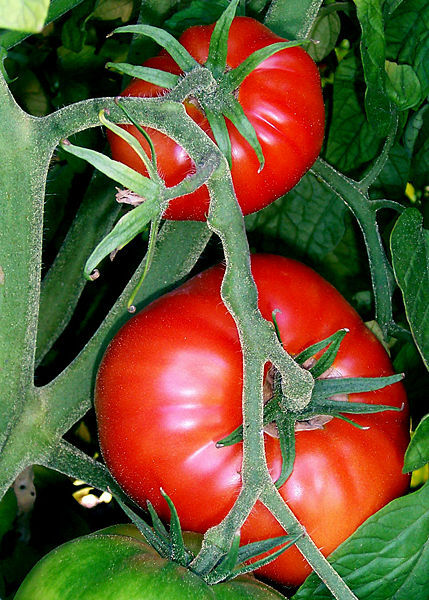 Get ’em from your neighbor, get ’em from a farm stand, but don’t miss that juicy flavor. A childhood favorite: Sandwich with toasted white bread, mayonnaise, thick slices of tomato, sprinkle with salt and pepper. Add bacon to that, and you have heaven on earth. Purely southern edition: Hot biscuit with butter and thick slice of tomato, salted and peppered. Re-read a favorite book. Some of my friends think this is crazy, but I count a summer wasted that doesn’t include either Pride and Prejudice or Persuasion. Romance novels and Agatha Christies count as well–whatever makes you feel relaxed and good. Ride a bike. Not a racing bike with all the paraphernalia, just a plain old bike like a beach cruiser with coaster brakes. It’ll make you feel like a kid again. See a movie in an actual movie theater. Bonus points if you can find a drive-in and stay awake through the feature! Go to one last free outdoor concert. Especially since the heat has finally broken, it’s a great time to hear music in the open air. This is a pleasure that definitely disappears when fall draws in. It’s extra fun if you can bring a picnic, especially one that doesn’t take a lot of work. Get one small thing that reminds you of this summer, whether it’s a photo, a postcard or a picture torn out of a magazine, and put it on your refrigerator or bulletin board. Do not look at it until the first rainy day in November. Let me know if there are any other pleasures I forgot. Grilled hot dogs? Watermelon? Kickball? And enjoy the remaining days before the leaves begin to fall. This may sound strange, but I think the best year of my life so far was when I was five years old. I was the youngest in the family and everybody’s little princess. My sister Juanita spoiled me terribly. Her senior year in college, when I was five, she got a small, white, rather ancient Austin Healey convertible. She liked to dress me up and drive around campus with me riding shotgun. Her friends and boyfriends always clustered around the little car whenever we stopped. Juanita got me a library card when I was five. I had already learned to read, so this accelerated my love of books. When she graduated and got a job as a secretary and bookkeeper, she bought dresses for me. 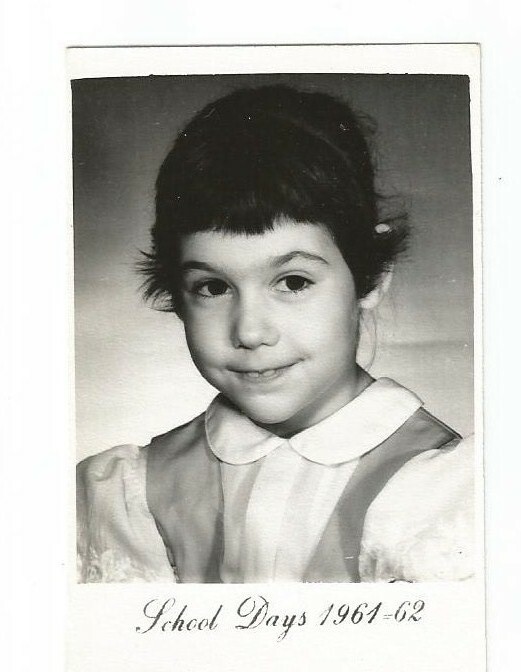 I remember a green one with white puffed sleeves and white embroidery, vaguely like a German peasant dress. She took me to her hairdresser for my pixie cut. Juanita even wrote to Miss Norma who was on the Romper Room children’s TV show in Nashville, so Miss Norma would see me through her Magic Mirror and call my name. I thought Juanita was beautiful, with her tiny waist, short dark hair and blue eyes, and her party dresses, frothy with crinolines. My sister Sherrie, who is 9 years older than me, played school with me, so besides knowing how to read I had basic math down as well. She was patient with me most of the time, which was especially meaningful since we shared a bedroom and she was a teenager. She moaned when I woke her up at 3 a.m. on Christmas Day, but she got up with me to see if Santa Claus had come. My brother Gil was more problematic. He got me to quit sucking my thumb by convincing me it would turn purple and fall off if I didn’t stop. He also liked to use me as a human shield when he and Sherrie were fighting. But how annoying is a five-year-old to a 12-year-old boy? The fun was over in late August of that year, when school started. I went into first grade as a five-year-old turning six in October, among the youngest, smallest and most scared in my class. And I stuck out like a sore thumb because I’d already done all the first grade work. My teacher gave me second grade work to do, by myself, and I joined the class for arts and crafts and recess. No wonder I cried to stay at home! Eventually (in second grade) I got over the strain of being alone and different in school. Mother bribed with a Madame Alexander doll to go to school and stay there. So life went on. And I grew to love school, do well, and fit in. But I still remember playing school with Sherrie and riding around in that Austin Healey. At least I got to be a princess for a year! I have an emerging alarm clock crisis. This is not an issue, I find, that most people deal with these days. Kids use their mobile phones as alarm clocks, as well as wristwatches, and have just about made those timepieces obsolete. Watches only survive as fashion items and status symbols among the young crowd. The bedside clock has become a charging stand for your iPhone or iPod. However, some of us still like to have an alarm clock on the nightstand. My problem is that I want an analog, silent, not-illuminated alarm clock with hands that glow faintly in the dark–in short, I still want the G.E. electric alarm clock I have had since I was in high school decades ago. My parents gave me that clock so I could be responsible for getting myself up and on the school bus at the crack of dawn. They were up, too, but the idea was that I needed to learn to do it myself, because they would not be there to get me up when I went away to college. I was never a heavy sleeper, so one buzzing alarm was enough. I carried the clock with me to college and after, and never saw the need to replace it. Clock radios? I didn’t want to hear music at that hour, much less talk. Battery operated? Only if I had to travel. I never thought about the little clock at all. I realized this is the last remaining appliance my parents gave me. Pretty amazing when you think about it. 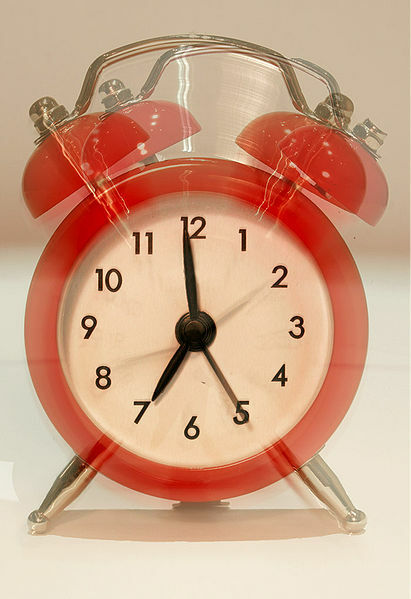 I love this clock and it has served me well, but the alarm seems to be wearing out. It just hums now instead of giving a full-out buzz. Frankly, at its age, I can understand, and most days a hum is enough. But what if I really need it to wake me? So I started on a search for another clock this weekend. I know you’re thinking, why not just get a digital clock and shut up about it? The answer, my friends, is the amount of light those blasted LEDs put out. When I sleep in a hotel room, I cover the standard bedside LED clock-radio with pillows to block the light. I need it dark to sleep! Okay, so why not get a clock that you have to push a button to illuminate? Well, unfortunately, I wake up a lot in the night, and I think that Indiglo is disruptive. And I’d have to reach over the cat to hit it, most of the time, which would certainly wake me up all the way. How much simpler it was when I slept like a log through almost anything! I bought two different clocks this weekend and returned them both. One had all the attributes I wanted, except it was battery-operated and ticked so loudly it could wake the dead. The other was silent, but had a light-sensitive face that immediately illuminated in the dark and couldn’t be turned off. So I searched Amazon and finally googled every attribute I wanted. The Seiko is in the mail, and we’ll see if it performs. If not, I may have to enter the age of iPod/iPhone as alarm clock, but I will be unhappy!